In some families she would be considered a black sheep. The L.A.Times ran a story the other day about a 77 year old woman named Doris Payne who spent 50+ years stealing jewelry from retail stores. Her formula was simple: Pick a nice store and look like you belong there. Make sure your well-cut outfit has deep pockets. She was good, but not good enough to never get caught. In fact, she has been convicted of grand theft several times and has spent most of the last decade in prison. She should be free by the time she is 81, if she lives that long. "It took me a while to become proud of her," said Ronald, of Louisiana. Now 61, he was born when his mother was a teenager. He was raised partly by his grandparents. "I realized she was very good at what she does and had fun doing it." So Ronald is proud of his convicted felon mother who was so busy stealing what probably amounts to hundreds of thousands of dollars worth of stuff that she couldn't be bothered to raise him because, after all, SHE WAS A GOOD THIEF and she ENJOYED HERSELF while she was stealing. Loving her in spite of her flaws would be one thing. But being proud of her? ... is currently playing: Steal Me Blind from the album Alf by Alison Moyet. ... that you do not get to pick your family, but you DO GET TO PICK YOUR FRIENDS (and your PASTOR/MENTOR). And nothing like tossing your grandmother under the bus if you think it will help you become leader of the free world. "I can no more disown him [referring to the "Reverend" Wright] than I can disown my white grandmother -- a woman who helped raise me . . . but a woman who once confessed her fear of black men who passed by her on the street, and who on more than one occasion has uttered racial or ethnic stereotypes that made me cringe." Writing on the Huffington Post website last week and in interviews with Chicago newspapers, Obama had said that when he sat in the pews at Trinity United Church of Christ, he had not heard Wright make some of his more controversial statements. On Tuesday, saying "nagging questions" remain for some voters, Obama offered a different account. "Did I know him to be an occasionally fierce critic of American domestic and foreign policy? Of course. Did I ever hear him make remarks that could be considered controversial while I sat in church? Yes," Obama said. Maybe he thinks that the Huffington statement was not dishonest because he qualified it by saying he had not heard Wright's "more controversial statements". And maybe he thinks he comes across as an honest guy when he admits, in the latest speech, that he had, in fact, sat in that church and heard "remarks that could be considered controversial." If so, he is wrong on both counts. No, make that three things. Sorry, Senator, but there really are no "nagging questions" about this issue. ... is currently playing: The End Of A Love Affair from the album Lady in Satin by Billie Holiday. Sometimes I can be such a dunderhead! I stupidly assumed that it meant that poor Hispanics were rethinking the notion of spending tens of thousands of dollars (and frequently ending up deep in debt) to celebrate their daughters' fifteenth birthdays. Ah, I thought, they are finally starting to get their priorities straight. But no. The "rethinking" has nothing to do with the issue of whether or not to have a party they cannot afford. The Church has just convinced these parents to use this "opportunity" to push a "pro-chastity message" on their girls. ... 51 percent of Hispanic girls get pregnant before age 20, according to the National Campaign to Prevent Teen and Unplanned Pregnancy. But couldn't that message be pushed without spending upwards of twenty grand per kid?? Party or college education? Party or college education? Hmmm.... Is it really that hard to see which will ultimately benefit a girl more in the long run? According to Luz Reyes, the mother profiled in this article, the party is "a prize for them being good." Remember when "being good" was what parents expected of their kids? You didn't get a prize for doing it, you just got something unpleasant if you didn't. At the risk of sounding like my mother, it was, in many ways, a better world back then. ... is currently playing: Dress You Up from the album Like a Virgin by Madonna. When the revolution comes, it won’t be pretty. It is August at the Jersey Shore, a place that gives new meaning to the word HUMIDITY. 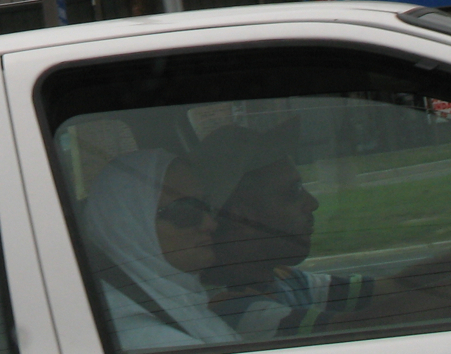 The bozo driving the car is wearing a short sleeve t-shirt and a baseball cap. His significant other is dressed like a mummy. I don't think God wants women to sweat to death.